Length: 3 hrs. 54 min. Finally, a much-needed biblical resource for individuals and small groups that addresses money and ministry in the marketplace. Every life requires a spiritual foundation. “Grandfather, you left this . . . .” Julio lifted the leather-bound journal and stepped toward the old man. “It is yours now,” said Antonio, with a gleam in his eye. “I’ve lived my life according to the twelve principles recorded in it. And if you will apply its principles as I did, your success will be greater than you could ever imagine.” Be a minister in the marketplace. 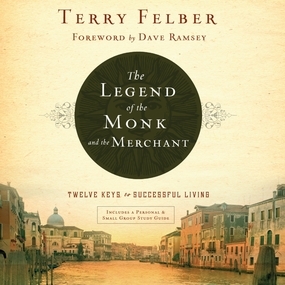 Terry Felber's story of the monk and the merchant, set in Rome during the Renaissance, is full of sixteenth-century adventure and real-world truth. As his tale unfolds, Felber asks and answers questions about family, creativity, innovation in business, and God. As he explains in a new foreword, this book helped Dave Ramsey rediscover the marketplace as a mission field — and merchants as ministers. Now let it open your eyes to the opportunities for service and leadership all around you. Are you ready for a change? The Legend of the Monk and the Merchant will change the way you see yourself, your job, and your purpose.